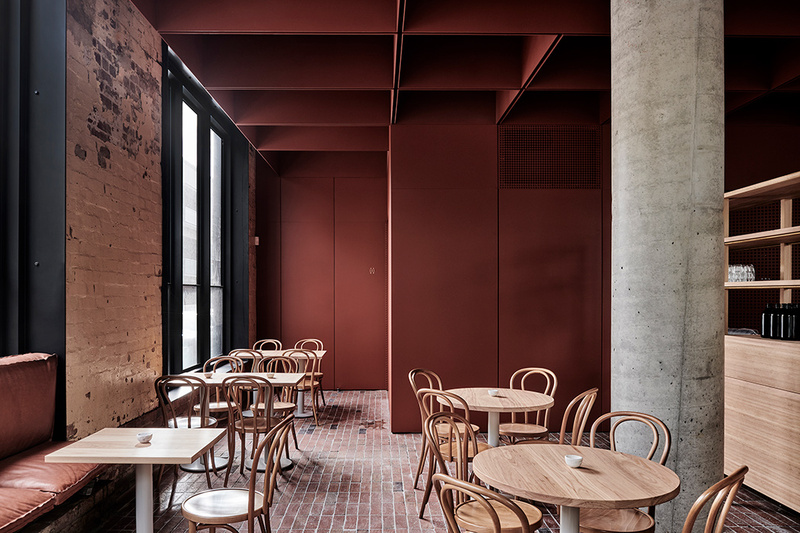 In the Fitzroy area of Melbourne the architectural office Ritz & Ghougassian has taken over the project of designing Bentwood café.The building they chose has a long and significant history of previous uses which is vibrantly reflected ,through its design, in the current use, both with the operation of materiality and the general atmosphere throughout the building. For many years it had been a furniture workshop under the brand name of CF Rojo & Sons; it was later used by the Thonet company as a showroom for Thonet’s well-known furniture. 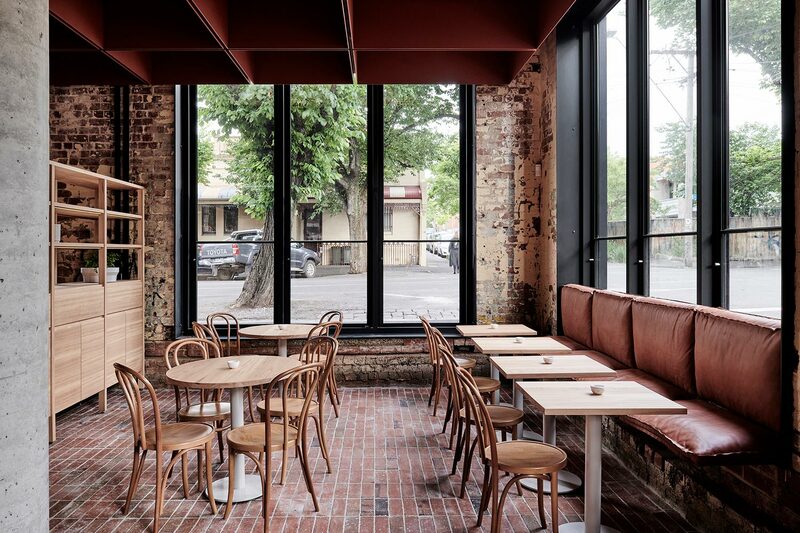 Τhe industrial character of the building’s shell remains as is, retaining the red firebrick facade as its valuable legacy. The same original brick is used on the floor as an adjoining highway that runs just below the visitor’s feet. It is an almost homogeneous scene with tonal gradations of terracotta shades that is set to offer an aura of relaxation. Natural wooden furniture, leather, clay-colored cushions and old stucco coverings on the masonry. The wall is of special design interest; it is coated with steel panels in a color that simulates oxidation. Its matte finish covers a wide surface of the circumferential walls showing off the existence of the new material. Some of the panels are perforated so that they allow a subtle glimpse into the kitchen. Leaves of steel were later used to shape a deep horizontal roof which the architects hope will create “sacs of light and shadow, of volume and intimacy”. 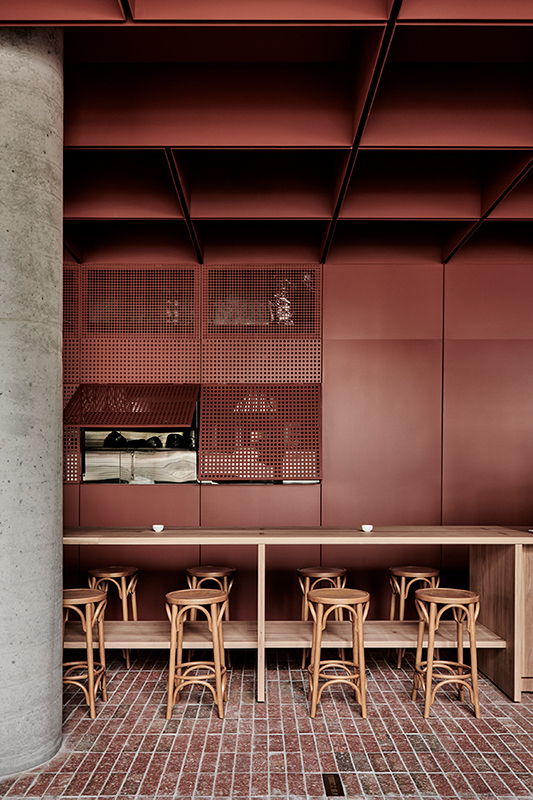 Besides, the owner’s instructions were to design a café so one feels, “just like one should feel in a café”. 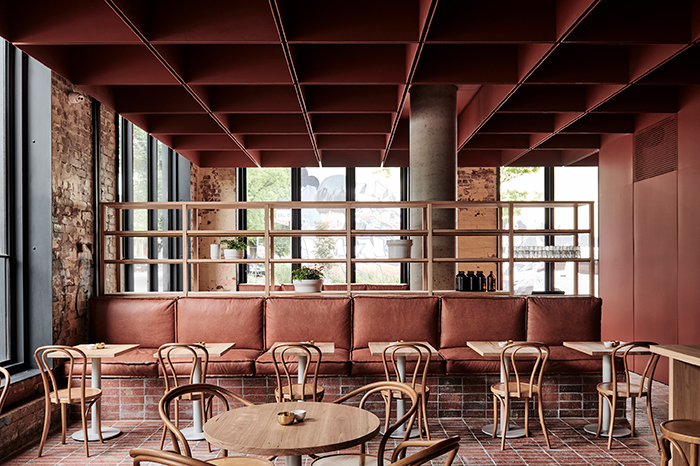 It seems that Ritz & Ghougassian have managed to design a very special space with new elements that pay tribute to the historical archetypes of the country as well as nostalgically traveling through its history.